Since the cancellation of their cult Sci Fi television show, the cast of Galaxy Quest have fallen on hard times. They are now resigned to opening shopping centres and signing autographs at Sci Fi conventions. However, everything changes when an alien race (called the Thermians) mistakes them for real astronauts. The Thermians have watched Galaxy Quest and believe the show to be based on factual “historical documents”. The Thermian race is under attack from the evil General Sarris (Robin Sachs) and they believe the Galaxy Quest team is their only hope. As a result, they have recreated every aspect of the show and have come to Earth to collect the unsuspecting crew. 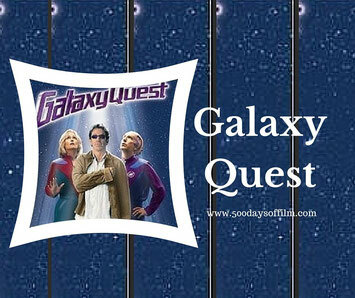 Can Galaxy Quest Commander, AKA actor Jason Nesmith (Tim Allen), and his jaded crew confront evil and save the day? Will Nesmith keep his shirt on? Will Gwen DeMarco (Sigourney Weaver) keep stating the obvious? Will Dr Lazarus (Alan Rickman) repeat his catchphrase without bitterness? You have probably already guessed why I decided to watch Galaxy Quest this week. When I heard the awful news about the death of Alan Rickman, I knew that I wanted to watch this fantastic science fiction spoof. Galaxy Quest features one of my favourite Alan Rickman performances (the other being Hans Gruber in Die Hard of course). For me, Rickman makes this film - he elevates it from good to great. Rickman is Alexander Dane who plays Dr Lazarus in the Galaxy Quest show. Lazarus is the only alien crew member on board. Adding insult to injury to the esteem of this highly trained Shakespearean actor, this means that Dane has to wear a fantastic prosthetic head. Dane, like many of the other actors on the show, has a catchphrase: “"By Grabthar's hammer, by the Sons of Warvan, you shall be avenged!" But don’t ask him to repeat it - he’s sick to death of the whole Galaxy Quest universe. He feels typecast in a role far beneath him. Rickman’s resentful eye rolling performance is just hilarious. He steals every scene. Galaxy Quest is just so much fun. The filmmakers have worked long and hard to create a hilarious, in depth study of Star Trek lore. However, don’t write this film off as just a Star Trek spoof - it is so much more than that. As ridiculous as it may seem, there is a lot of mileage in the film’s premise. And I love the fact that the cast/crew have to call on Galaxy Quest super fans to help them. The film's cast are all superb. Aside from Rickman, I particularly love Sigourney Weaver’s Gwen DeMarco. She has some fabulous lines. Meanwhile, the aliens and the film’s special effects are extremely impressive - as you might expect having been created by Stan Winston’s studio. Tim Allen has been talking for many years about the potential of a sequel to Galaxy Quest. The filmmakers wanted Galaxy Quest to have a PG rating. As a result, they had to cut some of the bad language out of the film. At one point, Gwen says “Screw that”... her lips, however, reveal something very different! The film is a loving spoof of Star Trek and was well received by the Star Trek cast and the show’s loyal fans. The Galaxy Quest spaceship even includes a reference to Star Trek in its serial number: NTE 3120. The ‘NTE’ reference is thought to stand for “not the enterprise”. Yes that is a wig that Sigourney Weaver is wearing - she got to keep it at the end of the movie. Galaxy Quest features Justin Long’s debut movie role… sweet! Steven Spielberg suggested the film include a romantic alien sub-plot. Star Trek director, JJ Abrams has said that Galaxy Quest is one of his favourite ‘Trek’ movies. The evil General Saris is reportedly named after film critic, Andrew Saris. Have you seen Galaxy Quest?